With new members recruited to the existing team, and the strong incentive to establish a long-term operative platform where the German and Israeli participants can bring their skills and knowledge to create concrete environmental projects, greenXchange 2013 was ready to roll! 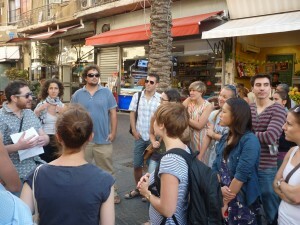 The third annual greenXchange seminar began in Tel Aviv, with a walking tour of “The First Hebrew City of Israel” (left picture). Participants attended meetings at the Ministry of Environmental Protection and at City Hall to discuss Planning and Sustainability, and Green Architecture projects. 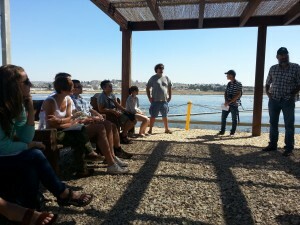 A tour in Bat Yam included the Butterfly Park and a local Urban Regeneration Initiative Center; participants learnt about how complex development procedures can be, and how cooperation between planners and architects, city councils, residents, and even scientists/ experts is crucial to achieving any progress. 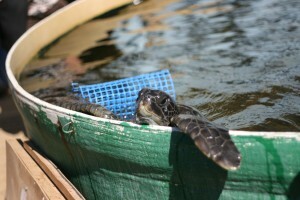 In Michmoret greenXchange was provided an insight view to Marine Biology in Israel and also learned about the Sea Turtle Station (right picture), that helps to recover injured Sea Turtles, with its unique project. Participants got a taste of KKL-JNF’s Forestry activities from touring the beautiful Biosphere Park in the Menashe Hills, a recently recognized UNESCO Biosphere Reserve and the heart of KKL-JNF’s forest projects in the area. Further North in the Eastern Galilee, greenXchangers engaged in discussion with a KKL-JNF Forestry Representative about historical and current projects, problems and solutions, and some ecological and political challenges faced in Israel today. The group enjoyed a hands-on experience in the Biriya forest through the “Forester for a Day” program (left picture), understanding that KKL-JNF represents more than just “planting trees”. A visit to Rish Lakish, a family-owned ecological olive press in Zipori, enabled participants to learn about and experience first-hand the process of harvesting olives (right picture), and to better understand some of the environmentally harmful side-effects of modern olive-industry practices. The group was very impressed by the eco-architecture, and the family members who told their story entwined with passion and philosophy. 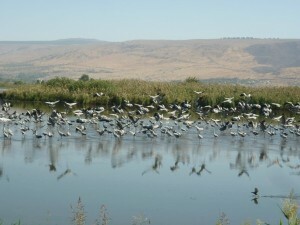 Another point of interest was the Hula Valley, where participants enjoyed an eco-tourism bird-watching excursion (left picture). The history of the region was detailed, and the group learned about the complexities involved in altering an ecosystem (consequences of draining the valley’s marshes) and the economic/ ecological drawbacks and benefits to a restoration and rehabilitation effort. From there, a water drilling station was visited, exploring key concepts in aquifer “natural pumping” technologies and uses. The Northern R&D Station provided insight into current agricultural research and its application of technological innovations. A branch of the station, where natural geo-thermal waters are harnessed to grow and maintain specific edible fish breeds in ponds, was also part of the visit. Finally, participants met with local hero Mario Levy on the bio-kibbutz Sde Eliyahu to talk about the history of (and struggle for) sustainable/ organicagriculture in Israel, and current efforts to curb the negative effects of mass-production on the land and people’s health. 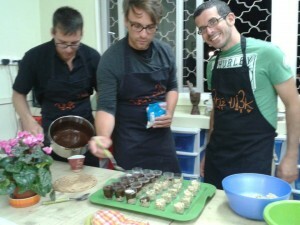 Throughout the seminar, the group also partook in bonding and team-building activities, such as a cooking workshop (right picture), a mountain biking tour near the Sea of Galilee, pomegranate wine-tasting, and cultural tours of the Old Cities of Yaffo, Tsfat, and Jerusalem. 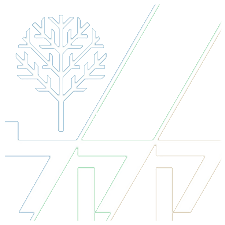 The seminar’s final days in Jerusalem, spent at KKL-JNF Headquarters, were dedicated to sharing summaries of the experience and brainstorming which directions greenXchange can grow. Alumni and various KKL-JNF staff were invited to give presentations; project groups were selected, and time granted to expand ideas for proposal; practical tasks and roles were assigned to participants to ensure the continuation of greenXchange in the future. On the horizon: greenXchange to meet in Germany, summer 2014! Find details about the seminar content here. 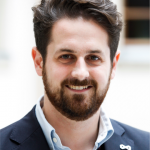 > Environmental Issues: Dominik presents a comparative look at Israel and Germany regarding its main environmental challenges. Measures are assessed on how to deal with those challenges. > Green Business Cases: Mario sheds light on innovative thinking in describing the regulatory frameworks for innovation and special “green business cases” in Israel and Germany. > Climate Change in Israel: Naomi depicts climate change as a mirror of the erroneous environmental management by humanity and its consequences for Israel. > Recreation in Israel: Yonatan describes the ups and downs of Israeli environment related recreation and explores the possibility of creating car-free forests. > Scientific Water Projects of the Jordan River: One greenXchanger describes the aspects of collaboration on sustainable development and peace making (Israel, Jordan, P.A., Germany). > Sustainable Tourism: Eva presents the concept of sustainable tourism on the example of two case studies- Sde Eliyahu (Israel) and the Forum anders reisen (Germany). 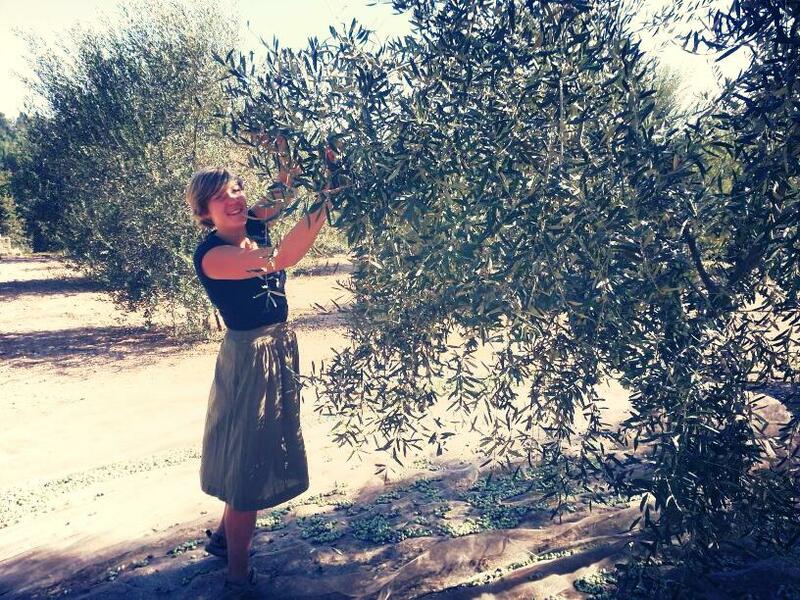 > Healthy Israeli Cooking: Anna writes about a healthy Israeli diet and gives us some insights into her daily alimentation.